HOUSTON (Jan. 23, 2019): Mexican warrior Jaime Munguia (31-0, 26 KOs) and Japanese contender Takeshi Inoue (13-0-1, 7 KOs) hosted a media workout today at The Knockout Factory in Houston, Texas ahead of their 12-round battle for Munguia's WBO Junior Middleweight World Title. The action will take place on Saturday, Jan. 26 at the Toyota Center in Houston, Texas and will be streamed live on DAZN - which is just $9.99 per month after a one-month free trial. Fans in Houston can purchase tickets starting at just $25 at ToyotaCenter.com. "I'm really happy to be here in Houston and happy to see how they treat me here. I'm ready to defend my title and give a great fight to my fans. Thanks for your support and I hope to give you a great show this Saturday." "There's a lot of competition at 154 pounds. I'm willing to fight all of them. I'm happy to start the year off early. I fight when I'm told to fight, so I'm glad that I'm already fighting in January. If they put four fights in front of me for this year, then I'll fight four times. I'm happy to be with the two best promoters of the world, Golden Boy and Zanfer promotions. I thank them for all the support they give me." "I've always idolized the U.S. since I was little and coming here, seeing the environment and food, I was born to fit into this environment. The jet lag is gone and everything is back to normal and I feel good. I'm in good shape. In the U.S., the focus on the fighters from media and fight fans are stronger than in Japan but what doesn't change is my desire to win the fight and I'm going to keep that the same. I'm ready for Saturday's fight." "Xu Can is a great fighter and I was very happy to have another opportunity to defend my title. There will be fireworks at the ring this Saturday night." "I am very excited for Saturday. I was training for 10 days in Miami and feel good. I'm excited and eager to win a fight for my Chinese fans." "I'm very excited because I haven't fought since September. I kept training, though. I only took a week off and went back to the gym. It's an honor to be promoted by Oscar De La Hoya. He has opened a lot of opportunities for me. I hope to be a world champion by the end of the year or earlier next year." "What makes me different from other fighters is that I work hard every day, even if I don't have a fight lined up. I'm always ready. A knockout would be great. But as long as I long as I look good and I get some experience, I'll be happy." "Training camp went great! I did some good sparring and I felt fast, I got a lot of work in. I sparred with Lamont Peterson and did really good work. It feels great to be in Houston, anywhere in Texas feels like home. We have a huge fan crowd and I can't wait for Saturday night." "Training camp started in Texas, and it went really well. We finished in DC with Lamont Roach Sr. My weight's good, I'm feeling strong. Houston feels like home. We have lots of family and friends. It feels great to be here, and we want to thank everyone for coming out, and especially to Golden Boy for having me and my brother here." 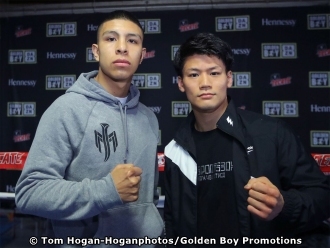 Munguia vs. Inoue is a 12-round fight for the WBO Junior Middleweight World Title presented by Golden Boy Promotions in association with Zanfer Promotions and Teiken Promotions. Rojas vs. Can is a 12-round fight for the WBA Featherweight World Title presented by Golden Boy Promotions in association with Universal Promotions. The event is sponsored by Tecate, "THE OFFICIAL BEER OF BOXING," and Hennessy "Never Stop. Never Settle." The event will take place Saturday, Jan. 26, 2019 at the Toyota Center in Houston, Texas and will be streamed live on DAZN. CREDENTIALS: Fight night credentials may be picked up from the Media Check-In doors located next to the Administration Entrance to Toyota Center on LaBranch Street and Clay Street beginning at 4:00 p.m. until 8:00 p.m. Proper personal Photo ID (driver's license or passport) must be shown to claim your credential. www.ToyotaCenter.com and by phone at 1-866-4-HOU-TIX. Tickets will also be available at the Toyota Center Box Office.